When a skunk first appears in the tuxedoed man's doorway, it's a strange but possibly harmless occurrence. But then the man finds the skunk following him, and the unlikely pair embark on an increasingly frantic chase through the city, from the streets to the opera house to the fairground. What does the skunk want? It's not clear—but the man is desperate to escape! Count on Barnett to write something strange, yet intriguing. Although with not as much humor as I suspected (which bummed me out a bit), it still is a fantastically written story in it's pure Hitchcock-like simplicity. Combined with the simple illustrations and monochromatic color scheme, it's a classic-feeling story for kids and adults alike. And, the best part, the simple text and story make for a great beginning-reader. 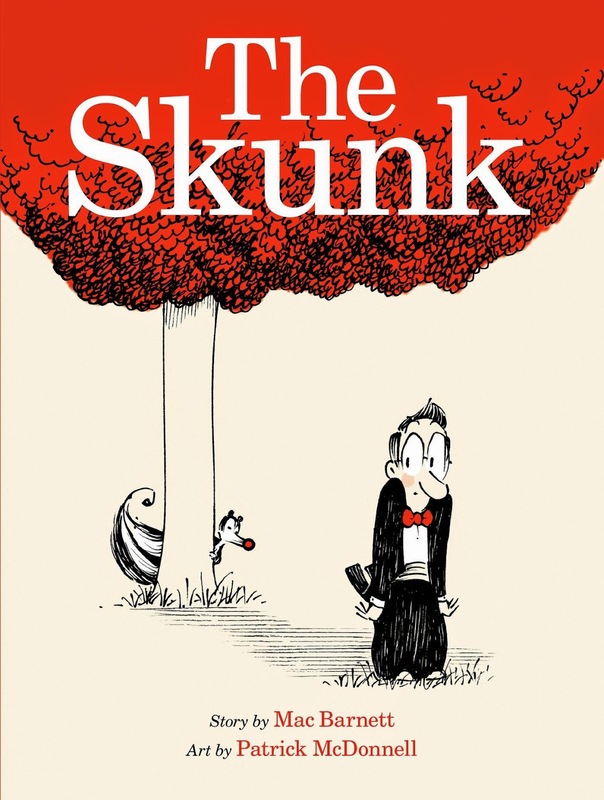 The confusing motive of the skunk and surprising ending make it great for any reader. See what you think.